Architects such as Vonnegut and Bohn, Francis Costigan, and Rubush and Hunter are well remembered and celebrated in Indianapolis, but how many of us can name a contractor from times past (other than Jungclaus-Campbell, a family-owned business on Massachusetts Avenue dating to 1875)? Contractors and carpenters are the unsung heroes of our built environment since they interpreted the architectural drawings and made them a reality. 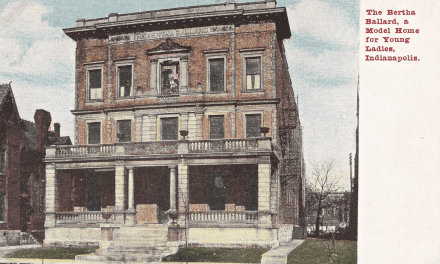 Wilmer F. Christian (1838-1929), along with James E. Shover (1841-1911), deserve recognition for their 24-year partnership between 1866 and 1891 when they constructed dozens of houses and buildings in central Indiana. They began with frame houses, eventually contracting for business blocks and more upscale homes. 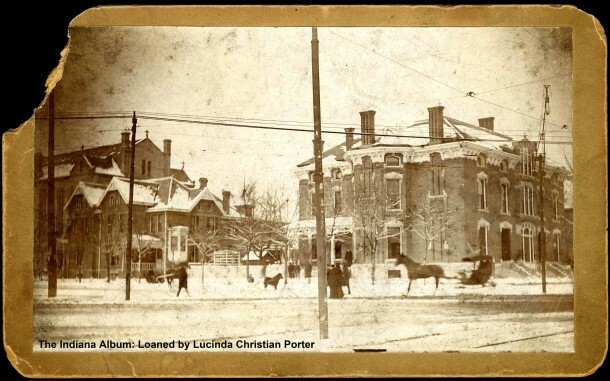 Their better-known buildings include the Bates Building (also called “The When,”), the Denison Hotel, Indianapolis Stockyards, the Macy and Malott houses, the Enterprise Hotel, the grand Bates-Allen-Parry-McGowan house, and the completion of the Benjamin Harrison house (now the Benjamin Harrison Presidential Site). One of Shover and Christian’s houses was Christian’s own brick Italianate double house built in 1885 at 404 N. Alabama Street (206-208 N. Alabama before the city’s address renumbering initiative in 1897). Wilmer Frederick Christian, Sr., and his wife Margaret J. (nee Moore) had lived in another house on this site since 1869 before building their brick double in 1884-1885. The large home stood on the northwest corner of N. Alabama and E. Vermont Streets in the same block as Roberts Park Methodist Church (seen to the west in the background). Although the well-respected contractor had refused requests to run for political office, he was a loyal Democrat who probably attended every Indiana Democratic Convention for fifty years. He had just begun construction of his house in the fall of 1884 when Grover Cleveland was campaigning. “I put my best men on the job and we had it finished by inauguration day [March 4, 1885]. On the hour when Cleveland took the oath of office I hoisted the flag on the house.” Approaching his ninetieth birthday in 1929, Mr. Christian told a reporter that modern houses were quickly thrown together, contrasting that with his own home: “its thick walls, cool in summer, warm in winter, its cherry woodwork and massive sliding doors, its stone steps and foundation, its lawn restrained by a coping of real Bedford [limestone].” Hanging on his walls were two treasures: a painting by artist Jacob Cox of Wilmer and Margaret’s daughter Clara who died young and a portrait of Margaret by Theodore C. Steele. Wilmer Christian’s “stork.” Christian had long admired a stork sculpture in front of his plumber’s shop. George Keiser made the bird with gas pipe legs and lead feathers attached to a wire body. The plumber steadfastly refused to sell his creation to Christian. One day word got out that Mrs. Keiser wanted a Jersey cow but her husband wouldn’t buy one for her. Christian took the couple to his cattle farm east of town and let her have her pick…only in exchange for the lead stork. Keiser finally agreed and even laid the pipe to the fountain in which the stork stood on Vermont Street south of the Christian home. The sculpture, mistakenly nicknamed “Christian’s Goose,” became a landmark but after many years the legs rusted and the wire frame caved in. People protested at the bird’s removal and one neighbor even claimed that he no longer could find the right streetcar stop. Years later Wilmer Christian requested help finding a good photograph of his stork. We don’t know if he ever received one, but zooming in on the scan from the ca. 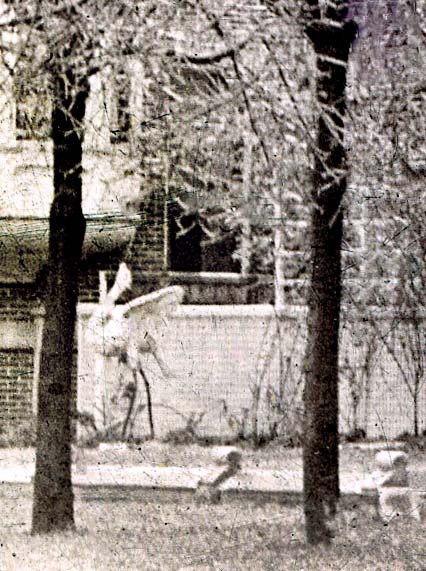 1890 photograph reveals the odd stork landmark. Located on a busy corner at the intersection of Alabama and Vermont Street and Massachusetts Avenue, the house must have been a bustling place. 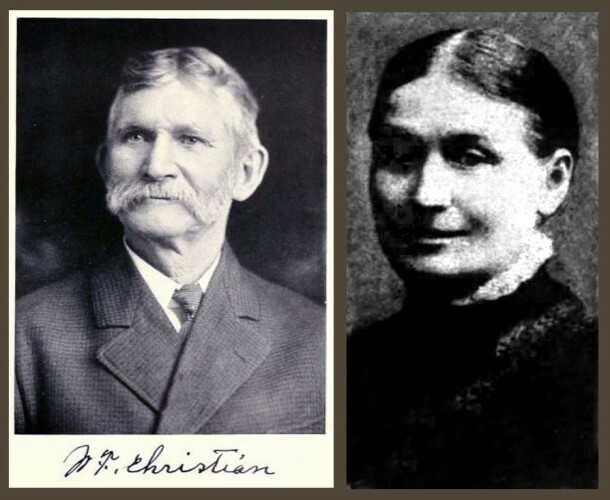 The Christians raised their six children in the home: Thomas J., Dr. Wilmer F. Christian, Henry E., Clara (who died at age 2), Frank, and Grace (Mrs. William Wharton) who moved to New Jersey. In a newspaper interview shortly before his death, Mr. Christian expressed his observations about changes in Indianapolis. He preferred the old days with quiet avenues and driving a team of his spirited carriage horses noting that “the cars got too thick for me about ten years ago.” Although many of his contemporaries were moving north “to the forties,” Christian, a widow since 1904, remained at his corner for sixty years, assisted by long-time servant Ann Schrader. Christian owned other land in Indianapolis that was inherited by his wife from the Thomas Moore estate. The estate included the land that later became Wonderland Amusement Park and the Pleasant Run Stock Farm in Irvington where he raised Shorthorn cattle–a profitable hobby. 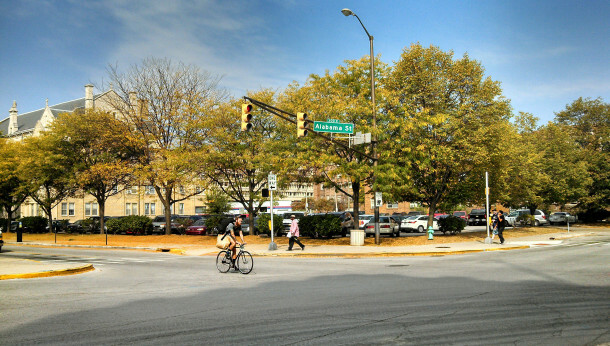 Today, the name Christian is best known for Christian Park on English Avenue on the southeast side of Indianapolis. 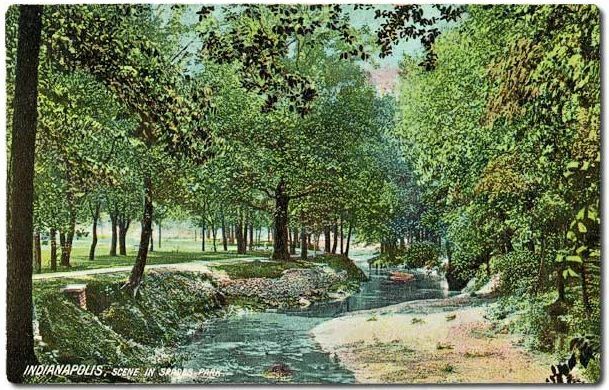 In 1921 Dr. Wilmer F. Christian, son of Wilmer F. Christian, Sr. and Margaret Moore, donated 40 acres of the estate to the city as a park in memory of Margaret (Moore) Christian. As development continued away from the city and this area became more commercial, the house became a rental property. In the 1930s Mrs. Minnie Berner rented out furnished rooms in the south half and the northern half was the massage parlor of Laura A. Fislar, who also lived there. 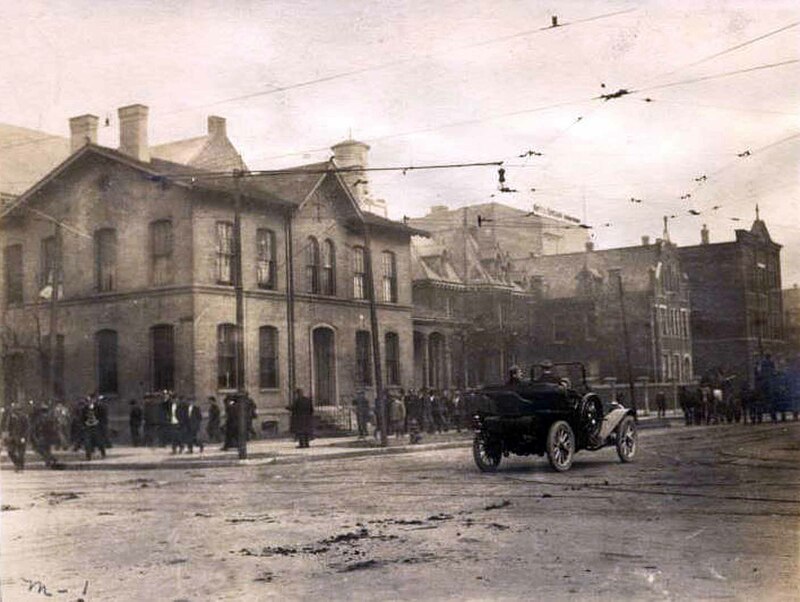 The Christian house and the brick house to the west were demolished in about August 1939 to make way for the Sears Auto Service garage (located diagonally across from the large downtown Sears store). Since the early 1980s the site has been a parking lot for Roberts Park United Methodist Church. We would like to learn more about Indianapolis contractors, carpenters, artisans, stone masons, decorative painters, plasterers, wood carver, architects, or others involved with the construction trade. 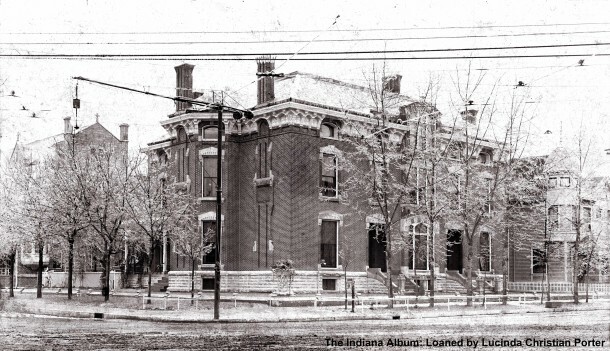 Did your ancestors help build Indianapolis? Please share details in the comments below or email heritagephotoservices@gmail.com. “Wilmer F. Christian at 90 Longs for Spanking Team.” Indianapolis News, February 5, 1927. “Contractor Many Years is Victim of Heart Disease.” Indianapolis News, September 3, 1929. Krull, T. V. “Leaden ‘Stork’ That Stood on Christian Lawn Recalled.” Undated newspaper article, [ca. 1929]. Dunn, Jacob Piatt. Indiana and Indianans: A History of Aboriginal and Territorial Indiana and the Century of Statehood, 1919, opp. p. 1512. Obituary for James E. Shover. Indianapolis Star, June 23, 1911, p. 10. “Service Station to Replace Landmark,” Indianapolis News, August 3, 1939, p. 3. (c) Copyright Joan Hostetler. Please credit author and provide link to original article. There was a Christian who owned a lumberyard at 9th and Alabama Streets. 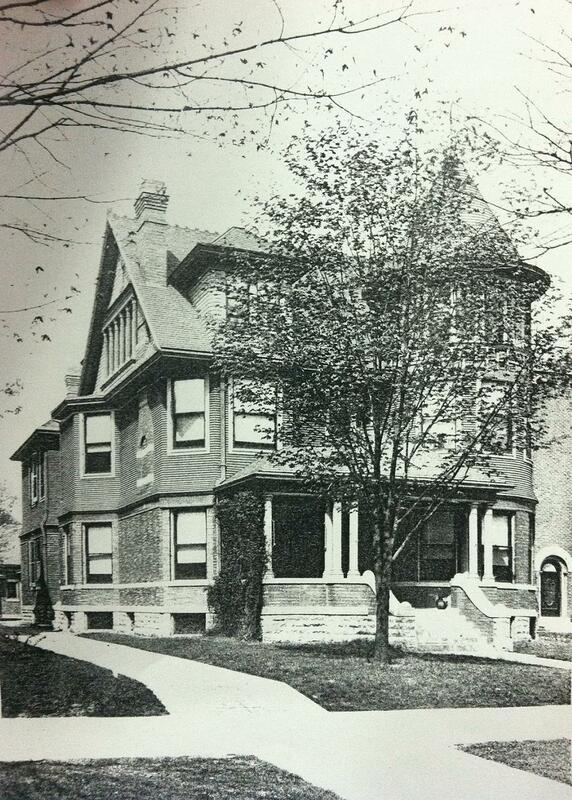 In fact, the large wood frame mansion with the tower at the Southwest corner of 9th and Alabama was the Christian home. I wonder if there is any relation? The lumberyard owner was John E. Christian (1846-1909). Although I have not found proof, I believe that he was the younger brother of Wilmer Christian, Sr. They were both born in Maryland, John lived with Wilmer’s family in 1870, and he is buried in the same lot as Wilmer’s family.